On Saturday, October 5th, my heart broke. I felt outraged, silenced, and betrayed as I watched the Senate vote to confirm Brett Kavanaugh to the Supreme Court. Forty nine Republicans and one Democrat showed that they have no respect for our autonomy, our health, our voices, or our stories. I still believe that we will win. I believe we will win crucial elections at all levels of government next month—here in Vermont and around the country. I believe in the power of our movement, in the power of grassroots organizing to unify and elevate the voices of individuals, who have been previously silenced. I still believe. I still believe survivors. I still believe the stories I heard at home and in DC. I still believe in the strength of our voices joining together. I still believe our efforts had an impact. I still believe that in the face of special interests and ultra-conservative billionaires executing a long-term strategy to take over our courts and state governments, we can win back rights for our communities and build a real democracy. I still believe that we will win. JOIN RAD TODAY & HELP US FIGHT BACK IN THIS ELECTION WITH AN ANNUAL OR MONTHLY CONTRIBUTION. Our movement emboldened folks from across the nation and all walks of life; all socioeconomic backgrounds, sexual orientations, all racial and gender identities, spanning generations. I am deeply moved by and thankful for the brave individuals, many with far less privilege than myself, who dropped everything to put their bodies and reputations on the line in this effort. People spent hours in planes, trains, buses, and cars to get to DC. They left partners, children, pets, jobs, responsibilities, and comforts at home to sleep on church floors and spent 13 hour days demonstrating, repeatedly risking arrest. Thousands of individuals made great personal, physical, and financial sacrifices to participate in this movement. 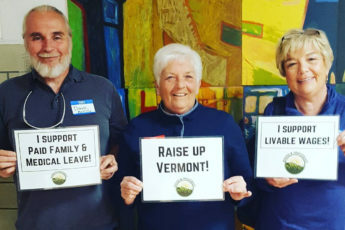 For the past month, I’ve been working at Rights & Democracy to help focus the anger of many of our members to organize vigils and marches in Vermont and New Hampshire. 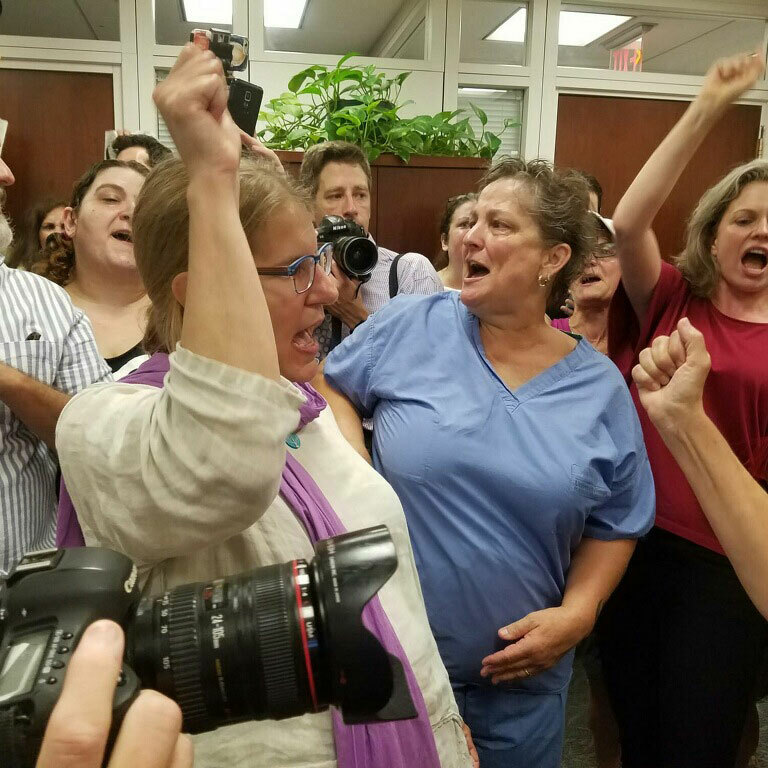 I also organized and accompanied RAD members to confront Senators in the hearing rooms, streets, hallways, and yes even the elevators, in our nation’s capital. I believe that we must use every tool in the social change tool box and join national grassroots movements while also organizing in our own communities. In Maine, Ady Barkan’s Be a Hero Organization raised millions of dollars—$20.20 at a time—to send Senator Susan Collins a message: vote “no” on Kavanaugh or we will fund your opponent. When she announced her vote on the Senate Floor, the fundraising website crashed. As of today the fund has raised more than $3.7 million and continues to grow. Now that Kavanaugh is confirmed, we must double down our local and federal efforts. We must create legislative protections for the rights currently at the whim of judicial precedent. 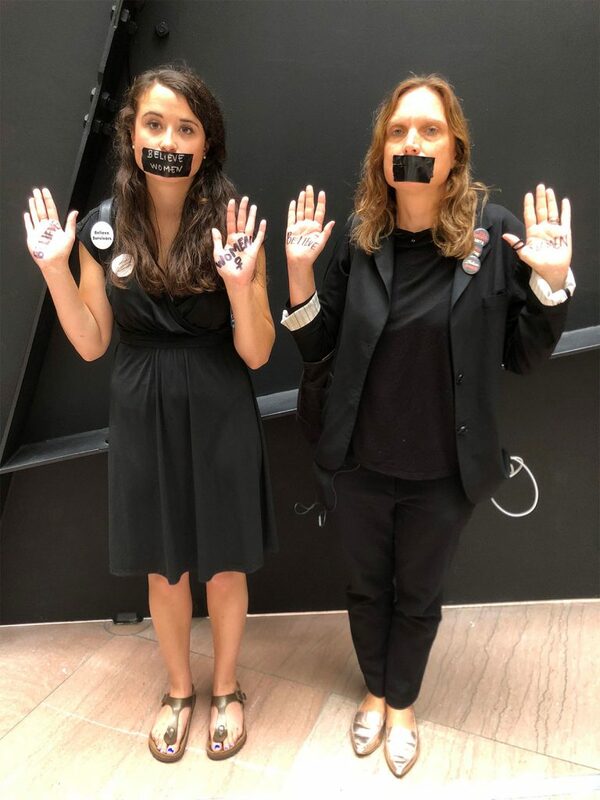 We must run for office and support those who already are, like RAD endorsed candidates Mari Cordes and Kate Larose, who joined our #CancelKavanaugh efforts in Washington, DC. Here in Vermont, the same political forces that rushed Kavanaugh’s nomination process are buying up huge amounts of airtime to attempt to put their thumbs on the scale for Gov. Phil Scott and are working to defeat Lt. Governor David Zuckerman. I am counting on you: my friends, neighbors, fellow Vermonters, to join me. Not only to vote on November 6, but to tell your own communities, coworkers, family members, friends, and children to vote. THANK YOU FOR BELIEVING IN RAD BY BECOMING A MEMBER TODAY WITH YOUR ANNUAL OR MONTHLY DONATION. Add your voice to the chorus of “we believe.” I know we can win back our rights and social change if we ban together through grassroots organizing. Join me: Together, we win.